recommended for: Grown-up fans of Twilight. Younger fans of The Vampire Chronicles. 90s kids who never left the 90s. I could have rated this book higher, but I think I expected so much of it that I judged it more harshly than similar books. The writing is clever. The voice is unique. The setting is somewhat reminiscent of Bret Easton Ellis fastforwarded ten years and stuffed into the body of a teenage girl. All great things, right? Right. Except for something clearly referencing the best band of all time (read: Nirvana), I wanted more. I wanted darker. Grittier. Deeper than a vampire novel. And, ya know, not a vampire novel. What I got was a well-written vampire novel with a few plot holes but overall, a solid cast of characters and a refreshingly classic take on the undead. It may not have met all my lofty expectations, but it had enough atmosphere to stick with me, and I'd definitely recommend it to fans of paranormal romance, who are more in tune with its style than I am. The plot was a little haphazard. It started out in one place, dragged on through a slow reveal of the love interest's dark secret, and then sped up. Then all of the sudden we're meeting this other character. James was definitely the main driver of the story. Whit felt thrown in, like Bloom needed something to happen while James was away. His sudden affection for Quinn felt thin and contrived. But if you ignore that icky middle part, the overall story is entertaining. It's less about the cool neat new world of vampires and more about decadence, friendship, and what goes bump in the night. Okay, so I dinged it for being about vampires. I just can't put vampires in the same sentence with Nirvana. I mean, Bloom had the chance to do something super cool and new with James and his weird habits. That said, as a vampire novel, I thought the concept was dead on. (I amuse myself.) It felt more classic than Twilight, like Anne Rice for angsty teens. Dark, scary, dangerous--not the sparkly good guys of Meyer's world. Quinn is actually kind of annoying, but in that, "Hey, I was totally that annoying when I was that age" way. And sometimes in that "Oh my god, stop being a total idiot moron" way, but I was hooked enough on the story to stick with her. She's messed up and selfish and she knows it, which is refreshing. 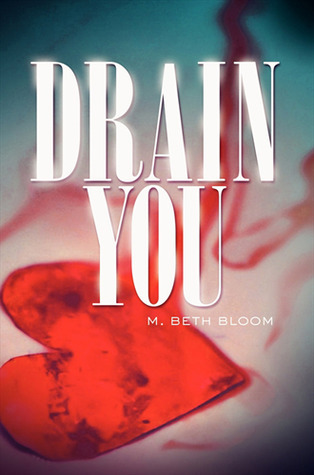 Bloom doesn't try to hide her faults. I think because she's so obviously and transparently flawed, I respected her for it. The side cast is a little more variable. James feels cardboard. Libby is one of the better developed, as far as the brainwashed party girl can be. I really liked James' sister and wished she was in it more. Whit could have been thrown out, or brought in more; he felt too in-between. This was the saving grace of the book. The style was just so gorgeously dark. It's hard to explain, but it had atmosphere. I felt dark and excited and ethereal while reading it. I felt like I always did reading about Lestat. Something about the 90s and its grungy apathy is so perfect for the undead, and it was a brilliant backdrop. All in all, it was the writing that kept me going, and that made this book much more memorable than your average throwaway teen pararomance. Don't use Nirvana songs unless you're going to go deeper than blood jokes. The editing was fine. Pacing could have used a tweak. A new-old vampire tale that brings the grungy apathy of the 90s and the undead together around a wonderfully flawed heroine and her hopeless romance.